While I was at the Boulder Farmer’s Market over the weekend, I stopped by the one stand that was selling Asian greens. Oh boy, oh boy. It’s hard to get my grubby little hands on fresh Asian greens in this place. I looked over the spread while the little Asian woman spoke at me in hard, sharp, quick and somewhat pushy comments. “You like! ?” “Cook these, these good!” “Take two!” “How about gai lan or some bok choi? !” I smiled (Western culture) and tried to ignore her (Eastern culture) while I sought out what I really wanted… snow pea shoots. She was right, you know. They do cook down like any delectable leafy green does. I knew this. I also had a dirty little secret. My grandma picks the tenderest part of the shoots off and discards the tougher lower leaves – this is how she taught me to trim snow pea shoots and this is what I do because Grandma is always right. That meant the yield would be even smaller. So from two pounds of snow pea shoots, I discarded about a quarter of the weight in tough leaves and stems into the compost. 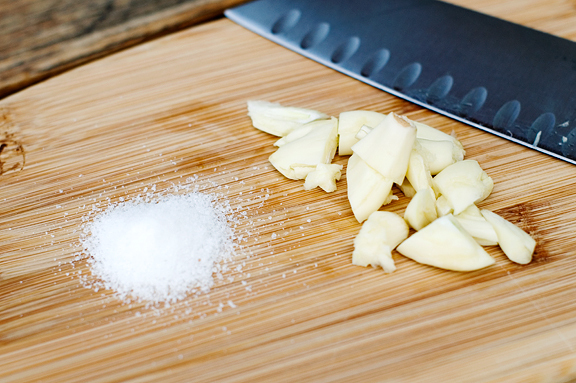 The preparation is simple which allows that delicate flavor to stand front and center. Snow pea shoots aren’t usually sandy like spinach, but these had itty bitty bugs, so we did a triple wash in the “plunge and swish” manner. Shake out as much of the water as you can since they are going into hot oil. I just heat up a little vegetable oil, toss in the garlic, and wait until the garlic begins to sizzle and release its intoxicating fragrance. 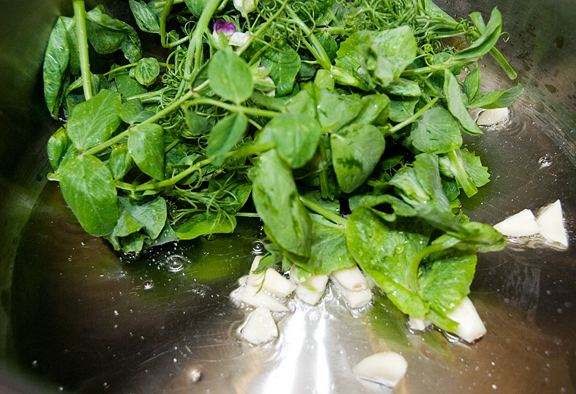 That’s when I add the pea shoots – all at once. The shoots cook very quickly, so as soon as they begin to wilt (like 30 seconds) sprinkle some salt over the greens and then stir-fry. 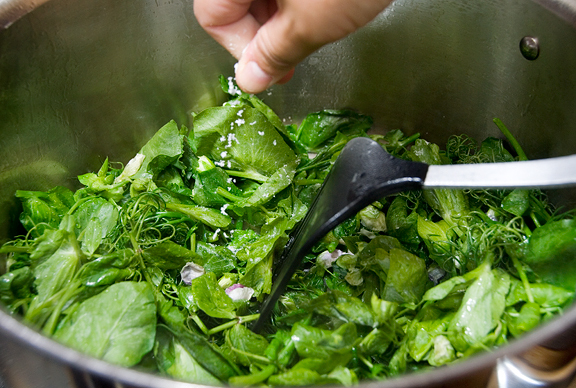 Serve the greens right away as they are best eaten hot. My batch had several baby snow peas (yay!) emerging from the flowers and they were particularly sweet and crunchy. Now how awesome is that? If the bottom leaves on the shoots are tough, you can trim the shoots by pinch off the tender tops (keep the tops, discard the bottoms). There are usually two and sometimes three tender tops for each “stem” so be sure you get all of the good tips. Wash the shoots thoroughly in water and drain, shaking out as much excess water as possible. In a large frying pan or wok, heat the oil over high heat. Add garlic to the hot oil and when it becomes fragrant, add all of the shoots to the pan at once taking care to avoid splattering oil. Sauté the shoots. When they begin to wilt, sprinkle salt over the shoots. Continue to sauté until all of the greens are just wilted. Remove from heat. Serve. gorgeous and delicious looking… love the chunky garlic. 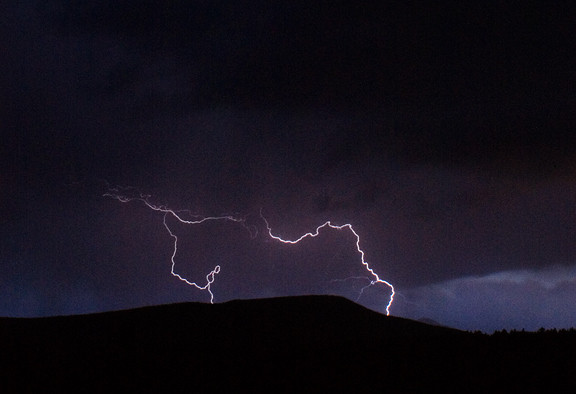 btw, did you have to use bulb setting to get the lightning? I’ve been grazing on my son’s peashoots in the garden. We planted them late and they don’t seem to like our CO heat. I wish they would grow just a little bit more so I could harvest the crop and cook them this way. Glad you didn’t lose an eye for our sakes. Ah my favorite chinese veggie dish! I’ve never had baby snow peas with my sprouts before though. Lucky girl! 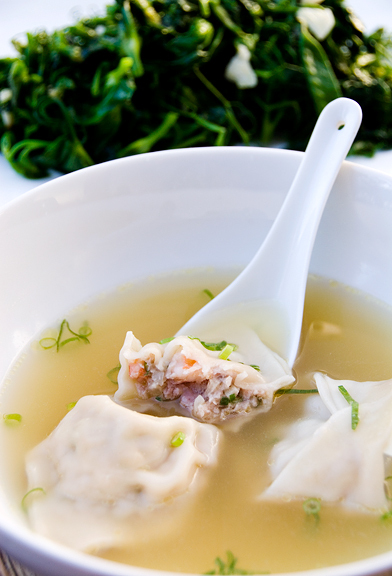 Those wontons are looking mighty good too. This is perfect timing! My pea shoots are just starting to blossom. I’ve always waited around for the peas and never cooked the shoots. Do you need to harvest them before the peas come onto the plants or is it okay to wait until the plant has produced and then trim the tops? Looks delicious. Thanks! Great for to eat when it’s steaming hot! Looks like you’re getting some major fireworks from mother nature! I love the description of the Asian lady at the market! Yeah, I’m getting a bit irritated at the heat here in WI too – two 95-98* days in a row is more than a bit crappy. 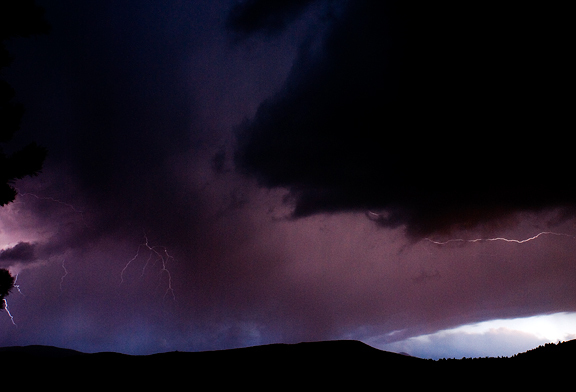 But I loooove the shots of your lightning storms – just stunning! And there’s one more reason to move away from WI, where I can’t find tiny, pushy Asian ladies who will sell me pea shoots. Looks wonderful and so fresh! It is really like a burst of spring with every bite. Oh! You gets two vegetables in one, heh heh :) Awesome. It looks like a perfect dish to rejuvenate a toxic, beat up bod. I’m glad your eye is okay, but how’s the lens?! I love how totally in touch with nature you are out there. Meanwhile, I love the city but these trucks parking with the engine on (seriously?! Motherf*!) are slowly killing me! mm, snow pea shoots are some of my favorite vegetables. Sorting the tough stems and leaves from the tender ones can be really relaxing, too. Wow Jen those are some amazing storm photos! I’m ready for some less insanely hot weather too. I’ve never eaten the shoots either, who knew? Thanks, will pick some today. 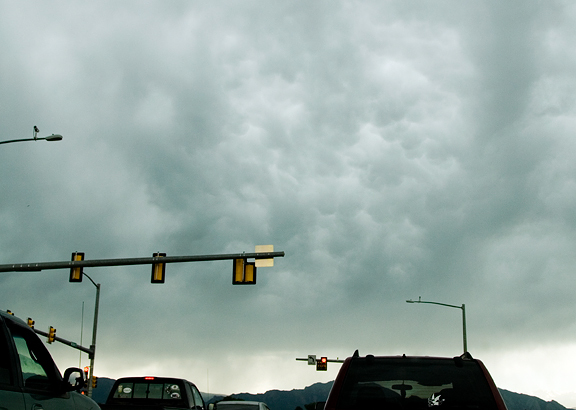 Love the storm pics, when I lived in Telluride we would take bets on what time it would storm, not IF it would, but when. I love hearing about Co, reminds me of my younger days out there, your pics are lovely. I’ve never even seen these! Its 10AM & my mouth is watering. Now I’m going to have to find some sort of market to buy these in South Carolina… I’m not very optimistic but it looks to be worth the quest. And my poor pup is about the same size as yours and she can hardly make it outside in our 95 degree – feels like 105 with 99.99% humidity – weather here in the South. Colorado looks to be beautiful! Great pics. I’m always simultaneously fascinated by and frightened of lightning. Oh, and stir fried pea sprouts with garlic? That’s what I’m talkin’ bout!! YUM. To Marisol…sorry you can’t find these in South Carolina, here in NC we have lots of Asians selling oriental green of all types at the Farmers Market!! like Jenn I found these snow pea greens, yu choy, bok choy and many other ones, I was using olive oil, but I am going to try your choice of vegetable or peanut oil with the garlis and a tad of salt. Wonderful pictures as usual!! Dou Miao? Mike is in love with you right now. IN LOVE. I’ll have to quickly wave some homemade pasta in front of him to get him back. 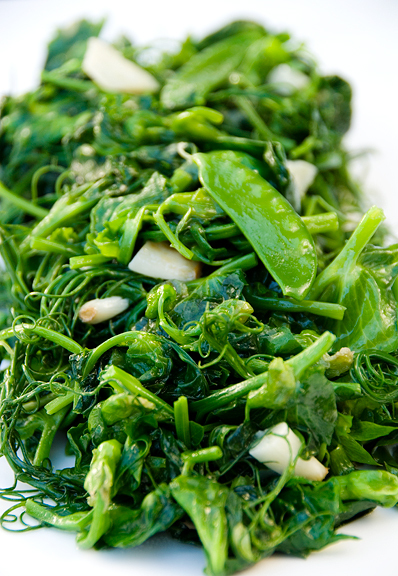 Mmm I love snow pea shoots! These greens sure are expensive over there! I’m glad greens are very afforable here since my husband loves them! Fresh vege needs so very little to boost the flavours! 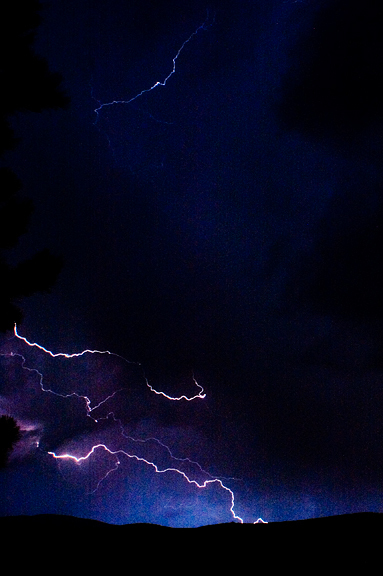 lightning storms while I’m outside freak the crap out of me, but while indoors they always have a relaxing effect – especially when they’re paired with heavy rainfall (best stuff to fall asleep to). Ravenous Couple – thanks! Nope, I didn’t use bulb. 15 seconds was enough to capture one or two strikes without saturation (there were some large cloud to cloud strikes that lit up the whole sky which I didn’t want). 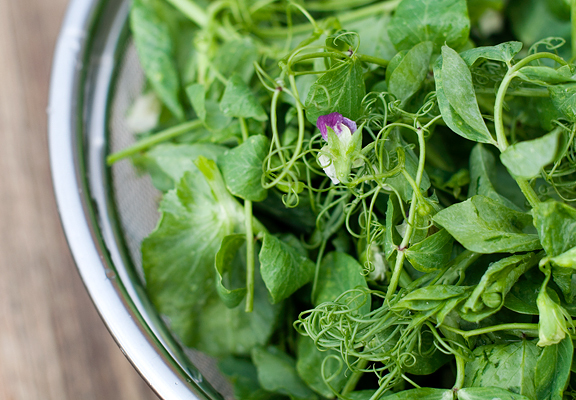 Mountain Mama – I’ve never grown anything here in CO, but my grandmother and parents used to grow snow peas and I remember enjoying the shoots. So good! Phoo-D – I’m not really sure because I am gardening-stupid. My guess is yes, you probably have to harvest before the peas form, seeing as there were a few baby snow peas in my batches. Whitney – I love that combo. Charlane – I didn’t think we did either. Sometimes it pays to visit the farmer’s markets! Mark – greasy lens, but easy to clean! Nature is here whether you like it or not. May as well embrace it, right? Steph F – oh, we’ll see. The foxes are hard to shoot because the light is very low and they are constantly moving. Steve – well, I’m just a major heat wimp and although our weather has been mild compared to everyone else, I dread when we get above 80 here. There is little respite from the sun. Farmerpam – awww, thanks. I quite love those storms. Y – me too! It’s so lovely and soooo deadly. Ruth – mmm! Glad you found a good source for the veggies. That is awesome. Mrs. E – I’m sure these are plentiful where you are. And I completely agree – fresh veggies need little else. I love Colorado, your photography and I needed a grandmother like yours! I should have planted Snow Peas instead of Sugar Snaps! Where have you been all my life? While I was in England attending 200 weddings, you were blogging the solution to my snow pea problem. I grew my own this year (easy), and now I know that when I grow my fall crop, I’m going to be harvesting more than just the peas. You rock, Jen. Lo and behold, the lovely Hmong women at the University farmers’ market had pea shoots. Now. In October. In Rhode Island. I got a bag to stir-fry tonight, and had to come back to this post to think about how to do it. Can’t wait! Thanks again for this! Trader joes is selling boxes of pea shots so bought some impulsivly since I remember you had a great recipe for them. They amazing, so fresh and well green tasting. (to use that idiotic iron chef phrase “it tastes like spring!”) I regret only buying one container.